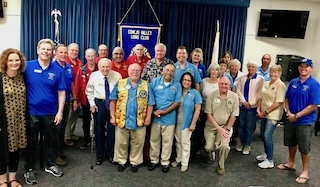 Our District Governor Dave Hubbard and Surrounding Lions Clubs from throughout the Central Coast meet with our Conejo Valley Lions Club on October 8, 2018. The Conejo Valley Lions Club is newly chartered and we are here to serve! Lions meet the needs of local communities and the world every day because they share a core belief - to serve their community. New members are welcome. If you live or work in Thousand Oaks, Westlake Village, Oak Park, or Agoura Hills, please consider joining us at an upcoming meeting. For more about Lions Clubs, go to www.lionsclubs.org.